Manners training fails us all. Many people consider themselves cordial and well mannered. If it is suggested otherwise, people might become offended. We like to think of ourselves as nice people, ready to help others and live a healthy, productive life. After all, our parents raised us well. Right? Today, for the first time, we have four generations in the workplace. Each with different communication styles and different values. What works for a baby boomer may not work with a Gen X’er. What appears to be rudeness may, in fact, be a communication gap. All of these factors contribute to the conviviality and productiveness of the work place. Whether we realize it or not, our values and beliefs guide how we conduct ourselves. Sometimes those values and beliefs are ‘blind’, in that we have conducted ourselves in a particular way for so long, that we may not even be conscious of it. Such is the human brain. Let’s say that a colleague has a habit of talking very loudly, rattling everyone around her. She doesn’t even realize she’s doing it. Her habit of talking loudly may be so ingrained, that she sees it as the norm. In actuality, it’s offensive to those around her. Another worker has a bias against body art. She doesn’t care for it and is not afraid to say so out loud, which makes for some bruised feelings on her unsuspecting co-worker, who loves her body art. The co-worker may even see it as a personal insult. Stereotypes can be even more ominous. Human beings have a tendency to be visual people. We tend to make quick judgements about people based on the way they look. Sometimes without knowing them. Buying into stereotypes can be dangerous, because everyone is fighting a personal battle we know nothing about. Be kind to people. Be gracious to people. Manners training needs to go deeper, to address the way we view the world, make us aware of our stress level and our stress buttons, and encourage us to be open in learning new ways to get along with everyone. We need to address how we are part of the bigger picture in the workplace, and how our time management, leadership skills (or lack thereof) and personal habits effect those around us. This is called conscientiousness (one of the layers of civility). We all need to having the feeling that we are useful in some way. That we contribute, in some way. Usefulness, whatever form it takes, is the price we should pay for the air we breathe, the space we take up, the food we eat and the privilege of being alive. It is its own reward for people to feel appreciated because they have been useful and beneficial in this world. Until manners training can break through the stereotypes, the stress level, the habits and the stereotypes, it may not be as effective as possible. It is too easy for people to default back to their regular comings and goings. It’s your life—but only if you make it so. The standards by which you live must be your own standards, your own values, your own convictions in regard to what is right and wrong, what is true and false, what is important and what is trivial. When you adopt the standards and the values of someone else or a community or a pressure group, you surrender your own integrity. You become, to the extent of your surrender, less of a human being. This sentiment is at the heart of meaningful manners/civility training. Until we accept the responsibility of looking at our lives in an unvarnished, truthful way, manners training may fail us all. 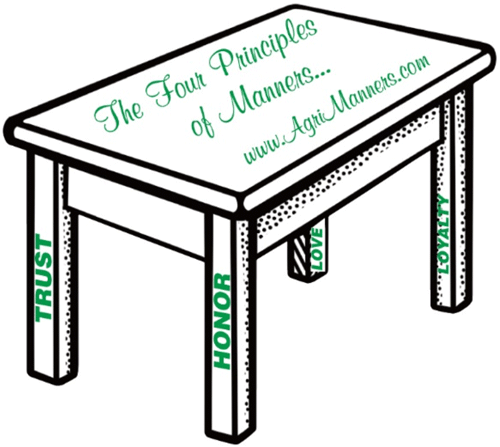 Contact us today for your meaningful manners training.